When time is on limited supply, read a short story. That’s my mantra and I really enjoyed reading three of them in Bug Stuff and Other Stories. The first story is Bug Stuff and I loved the opening line in this one and the fact that the heroine admits she’s never heard a man shout help ever before. 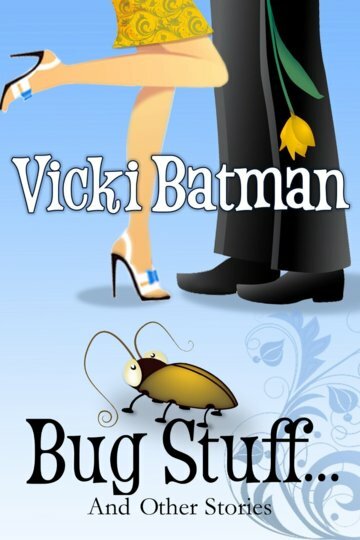 It’s a cute story about two co-workers who deal with a bug problem in the break room. The dialogue is snappy, the pace fast, and it made me smile. Second up is Just Desserts which was really well planned out for such a short read. I thought of it as a mini-me romance story with two characters you hoped would find some way to get together before the night was over. The final story is With This Ring and I loved the humor that Ms. Batman injected into the plot and dialogue. My favorite part was the fact that the heroine thinks one thing and then something wonderful happens to her. If you’re looking for a short, fun and romantic read, give this trio a try.